MarineLife Keyword List is a keywords file created by professional photographers to simplify wildlife keywording workflow. It contains keywords for nearly 12,000 species and marine life and includes not only common names, but also genus / species names, full taxonomic structure, descriptive terms, colors, behaviors, and more. Be sure to check out our blog, where we post breaking news and user reviews. Searchable by common name or part of the common name, the keyword list ensures that you will never again have to type in long pseudo-latin scientific names when keywording your images in Aperture* or Lightroom. In addition, a number of other taxonomic names such as the kingdom, phylum, class, order, family and other sub-categories exist as parent keywords and are automatically applied when you tag your image. MarineLife Keyword List can currently be imported into both Adobe Lightroom and Apple Aperture without adversely affecting your current keyword database. Upon import, the keywords are available for immediate use in keywording your marine wildlife images. MarineLife Keyword List sells for $99 and is available as a direct download. We also offer a trial version that includes keywords for 580 fish species, including angelfishes, butterflyfishes, damsels, parrotfishes and puffers. On July 26, 2012, we added a few thousand marine species to MarineLife Keyword List from the tropical Pacific (v2.0). Customers who purchased MarineLife Keywords on April 27, 2012 or later are entitled to a complimentary upgrade by contacting us and sending us your email purchase receipt. If you purchased before April 27, 2012, you can upgrade to v2.0 by purchasing the Tropical Pacific Fishes and Tropical Pacific Invertebrates Pack for $9.99. Customers who purchased the full list after July 26, 2012, do not need to upgrade. MarineLife Keyword List imports into your Lightroom and Aperture library easily and live side-by-side with your existing keywords. Import MarineLife Keyword List keywords into Lightroom and immediately have access to keywords for nearly 12,000 marine species. Go to our support pages for directions on how to import the keywords list into your Lightroom or Aperture library, and for usage tips on both platforms. Note that MarineLife Keyword List is a standalone product that may or may not be updated in the future. MarineLife Keyword List is a working photographer’s tool meant to simplify keywording for the underwater photographer and enthusiast. It should not be considered to be scientific reference material. Animal taxonomy and classifications change from time to time; keeping up with them would be more than a full-time job! If we do elect to do an update in the future, we will make an announcement using our mailing list. Join our mailing list. Automatic tagging of parent keywords exists in Lightroom only. Although Aperture is aware that a keyword exists in a hierarchy, it currently requires manual selection of parent keywords for tagging. Aperture also only searches keyword lists from the beginning of a keyword, meaning that if you search for “shark”, Aperture will not return “tiger shark” in your list of search results. 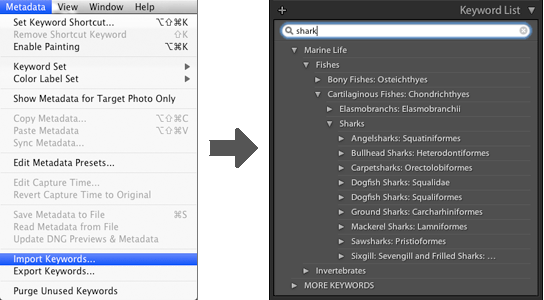 See our support pages for hints on how to use MarineLife Keyword List with Aperture. Are you interested in earning referral fees by referring your viewers and readers to MarineLife Keyword List keywords? We have a simple affiliate program that’s easy to join. Birds of the World, Mammals of the World, and MarineLife keyword lists are importable keywords files created by professional photographers to simplify wildlife keywording workflow for photographers. © Keyword Workflow; Powered by Squarespace.